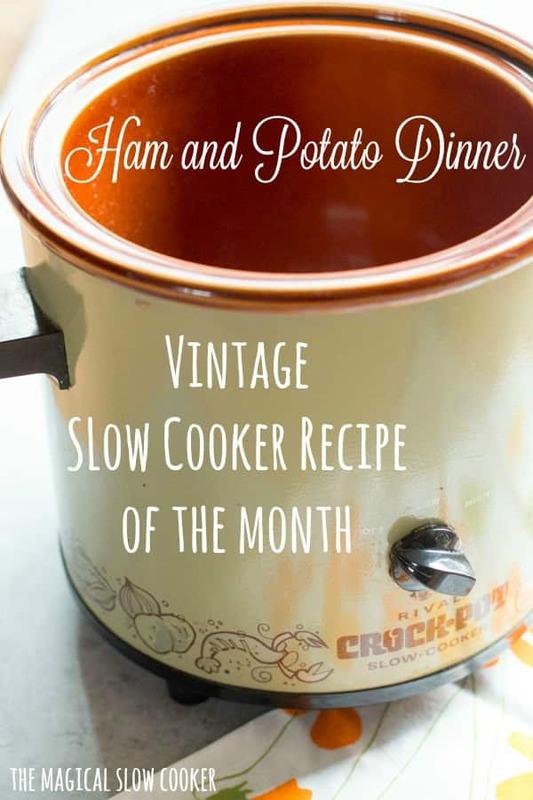 Slow Cooker Vintage Ham and Potato Dinner is stick to your ribs good! 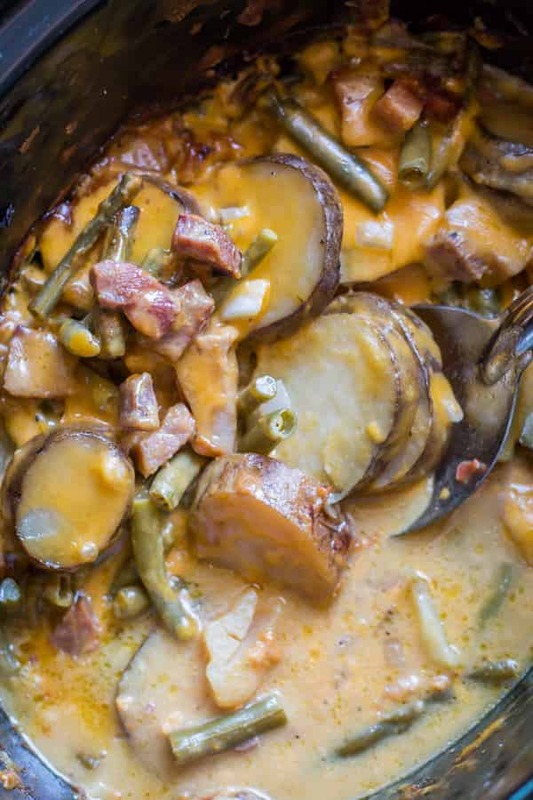 Smoky ham, potatoes and green beans in a cheesy sauce, what could be better? Hi all! 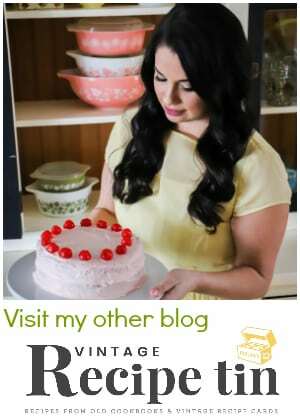 Welcome to another edition of Slow Cooker Vintage Recipe of the month. I found this recipe in my Amish-Country Cookbook. The version in the cookbook for this recipe wasn’t a crock pot recipe, but I easily converted it to the slow cooker. 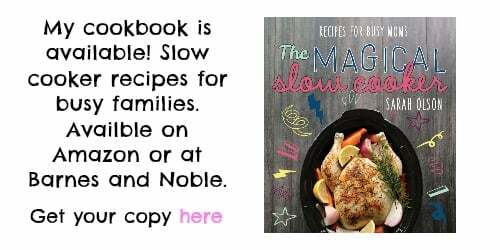 I love looking through my old cookbooks and finding recipes that can be altered a bit to be made in the slow cooker. This one does great. There is plenty of cheesy sauce to keep everything moist. The six hours of cooking time melds all the flavors together, you can taste the smoky ham in the sauce. Also the potatoes get fork tender, and the ham even gets tender too. Here is the YouTube video on how to put this Slow Cooker Vintage Ham and Potato Dinner together. You can follow me on YouTube here. Have a great week. 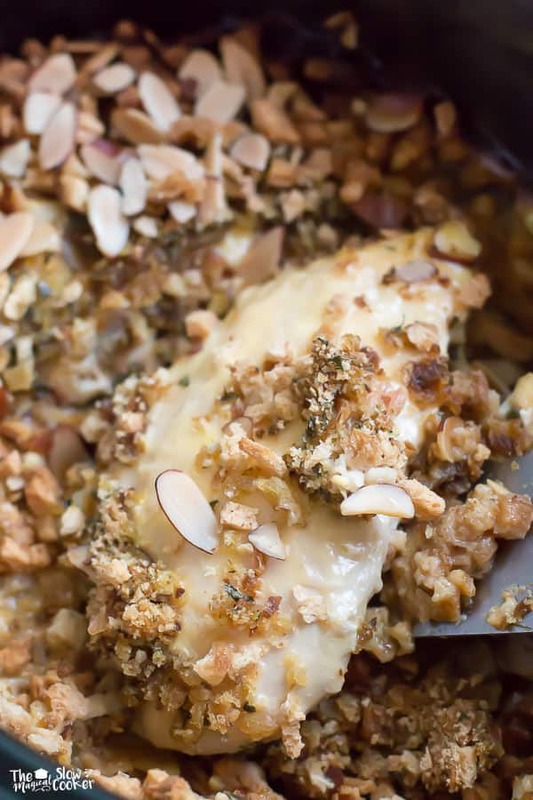 I hope you give this recipe a try, it’s a keeper! 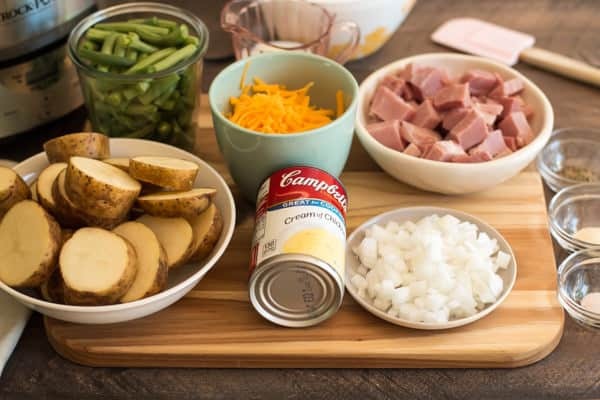 In a small bowl whisk together the can of soup, milk, salt, pepper, and onion powder. Set aside. 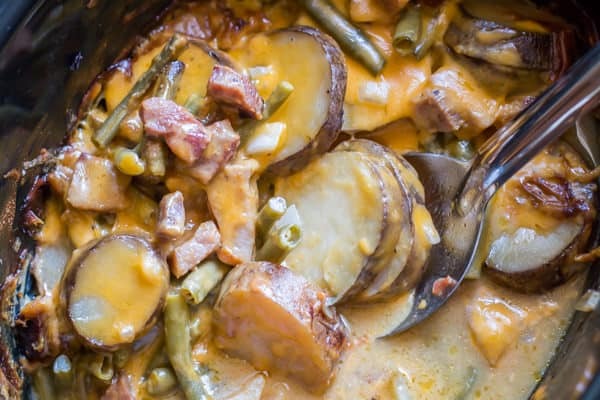 Add the potatoes, green beans, ham, onions and 1 cup of the cheese. Pour over the soup mixture. Stir everything together and take your spoon and flatten everything into an even layer. Cover and cook on LOW for 6 hours. When the cooking time is done, sprinkle over remaining cheese. Put the lid back on. Let the cheese melt, this will take only 5 minutes or so. 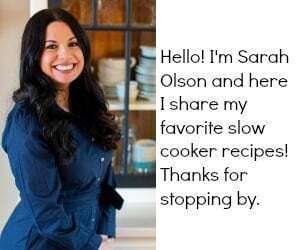 I used my oval 6-quart Crock-Pot Brand slow cooker for this recipe. My family has been making what you call Ham and Potato dinner for hears. However, we use real finely diced red or yellow onion; 2 cups of 100% milk or half and half and 3 tablespoons butter. This is turned into a casserole dish and nuked in the microwave for 45 minutes. Or you can do 30 minutes in the microwave and 30 minutes in a 350 degree oven. I don’t have a problem cooking this in the crock pot but using Cream of Chicken soup – you have got to be kidding – yick. That ruins this dish. I understand some do not like cream of chicken. My family loves it, if you don’t make your own substitutions. The onion powder is used in the soup/milk mixture and the real onions are tossed in with everything else. I use both in the video and recipe. At what temp and how long would you cook this if you were to do in oven? If I want to double the ingredients, would I have to increase the time and how much if I did? This looks so good. I think an hour more if you were to double. Definitely keep the lid on during the cooking time! 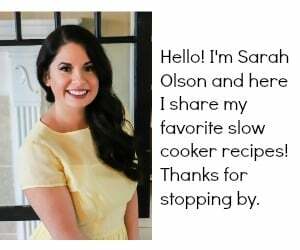 I love Sarah Olsen’s way because of the cream of chicken soup. Thank you for sharing your ideas. For you “analytical readers,” keep your opinions silent and just eat! Has anyone made this without the cheese? I guess I am the only person in the world that does not like cheese!! That would be good too! Could you use canned corn if you don’t have green beans? I don’t see why not! Sounds really good actually. Thank you for your recipe.Tried it with the corn and it was awesome! I’m making it now with cream of celery soup and corn instead of the cream of chicken and green beans. Hope it turns out well! Yes, that would work great! Could you use canned green beans? I don’t see why not, I love canned green beans in crock pot recipes. How thick do you cut the potatoes?